While all indications are that Super Aguri have been saved after a winter of uncertainty, Formula One is still not able to breathe a sigh of relief, for in Malaysia it became known that the other customer chassis-operating team, namely Scuderia Toro Rosso, is now officially up for sale. And, while their situations are totally different, their woes are certainly inter-related, and stem back to suggestions made by the sport's controlling body, the FIA, that customer chassis would be legal under the 2008-onwards Formula One regulations. While Aguri's entry into F1 was driven by marketing considerations - the team came into existence in order to provide Honda with a vehicle with which to keep Takuma Sato in the formula - there exists little doubt that the widely anticipated customer chassis clause played a major role in the decision-taking process. As proof, look little further than their use of a three-year-old Arrows A23 chassis in their first season, and the tiny team's unashamed pressing into use of Honda's race-winning RA106 chassis for 2007 and widely publicised plans to run full Honda kit this year. These intentions were, of course, scuppered by Williams's legal threats over proprietary chassis, which compounded Aguri's financial difficulties. Toro Rosso's situation is, in essence, similar, even if the details differ greatly. 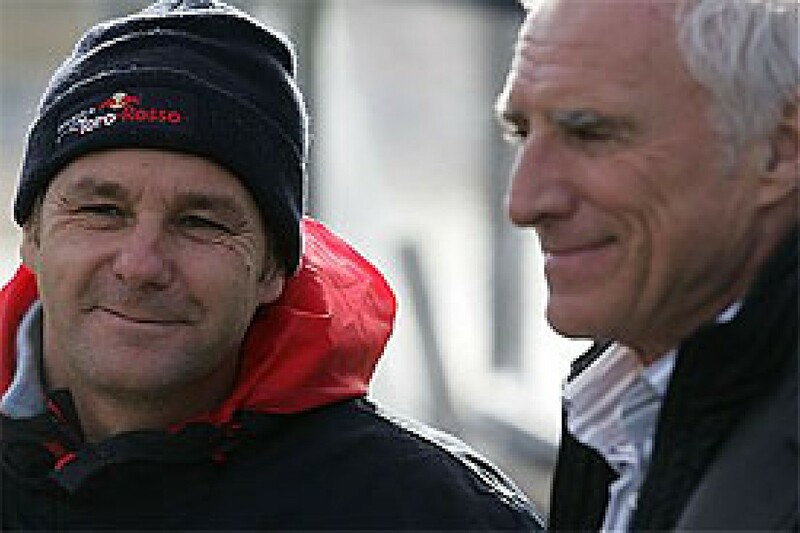 The former Minardi team were acquired from Paul Stoddard by Red Bull boss Dietrich Mateschitz as a means of providing Red Bull Racing with both a junior team and a secondary outlet for their technology. The problems for Aguri and Toro Rosso began last year when Spyker (now Force India) team principal Colin Kolles initiated arbitration proceedings against the two teams over their usage of customer chassis a year ahead of the 2008 regulations, which were then thought to permit such vehicles. In a separate, but not unrelated, matter Williams threatened legal action against Prodrive entering the sport by relying totally on McLaren-Mercedes technology. The net effect was that Prodrive withdrew, and, where once the FIA had proudly promised 24 cars on the 2008 Melbourne grid, just 22 took the start, with two of those - Super Aguri's entries - hardly having turned a wheel this year, and having but three nose cones between them. That the team needed to find an alternative buyer/backer was clear, with their situation being compounded by revised F1 regulations that demand the teams build their own cars from 2010 onwards. By 'build' the regulations imply that they own fully the intellectual property to the designs with which they go racing. Thus, last week Mateschitz admitted he was looking for a buyer for his share of Toro Rosso, a move which is said to have taken his partner by surprise, and while a deal is not urgently required as was the case with Aguri, the bottom line is that the team, or even a 50% shareholding, will not be easy to sell for various reasons. First and foremost, the former Minardi premises have enjoyed comparatively little investment in recent times, simply as there had been little or no reason to increase the capacity of a company that buys in 90% of its technology. Then there is the question of engines and KERS: at present Toro Rosso run Ferrari units, and while various parties suggested in Malaysia the deal runs until the end of 2009 (tying in neatly with 2010's chassis regulations), others maintain it expires this year with a one-year option (tying in very neatly with the introduction of KERS). Either way, Toro Rosso face some major expenditure on that front, and given their rather sparse (in F1 terms) facilities spread all over an industrial park in Faenza, Italy, some major investment will be required quickly to achieve both the 2009 KERS and 2010 chassis deadlines. Whether or not Ferrari will wish to continue supplying the team with engines come the end of the contract is another question. This column has it on good authority that the rationale behind the supply deal is that the Italian squad intended Toro Rosso to be their 'B' team in similar fashion to the aborted McLaren/Prodrive operation, with one major difference: Ferrari were planning upon two 'B' teams, namely Toro Rosso and the then-Spyker operation, which at that stage was backed, like Ferrari, by Abu Dhabi money. 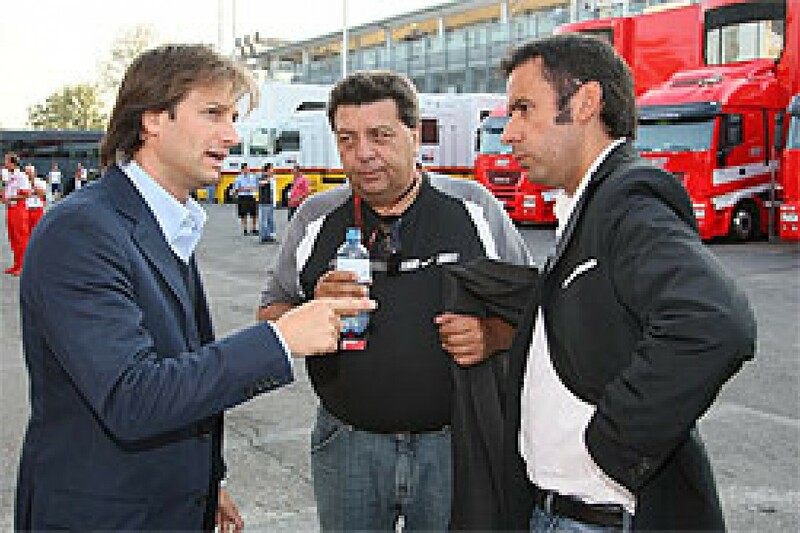 In fact, sources indicate that a deal had been all but struck between A1GP chairman Tony Teixeira and Toro Rosso (although Berger has consistently denied it) in which Ferrari would supply a turn-key test and race operation to A1GP, which in turn would brand the team in its own colours to publicise the self-styled 'World Cup of Motorsport'. However, an indication of the difference in expenditure between running customer chassis and manufacturing same to own design came in rather ironic fashion earlier this week when Mateschitz's charity 'Wings For Life' auctioned off the RB03 raced by David Coulthard at Silverstone last year on eBay, where it reached just 210,000 euro. Effectively, RB03's design provided the basis for the Toro Rosso, which took a top ten qualifying position and scored two points for the team in the hands of Sebastian Vettel and Sebastien Bourdais respectively in Australia a fortnight ago. Could Toro Rosso design and manufacture two competitive chassis with which to go racing and score points in their own factory for just half a million US dollars, or provide each driver with race and back-up cars for under a million come 2010? Of course not, but while this slightly left-field example is skewed by commercial forces, it certainly illustrates the point. The same applies to KERS: are Toro Rosso in a position to design and manufacture their own energy recovery system, or will the outfit be forced to rely upon a Ferrari-supplied unit? Bearing in mind that such systems are designed to work with custom transmission designs, does this mean Toro Rosso, which pioneered cast titanium transmissions in their Minardi days, will source gearboxes from Ferrari as part of the deal? Finally, what about sponsors and drivers? At present one of the biggest assets Toro Rosso have is one Sebastian Vettel - the only teenager ever to score a Formula One world championship point. Although a tug-of-love between BMW and Red Bull, both of whom believe they have a hold on his long-term services, is likely within the next three or so years, he is presently a Toro Rosso driver, and doing a fine job, too. In terms of sponsorship, Toro Rosso have to date relied upon stipends from the drinks company, with the team's marketing, media and hospitality departments effectively operating as satellite operations controlled by the mother ship. But, with Mateschitz selling out, such funding and infrastructure will cease. In that case, the team will have to re-establish departments dismantled immediately after the Minardi purchase. Until as recently as last month there existed a chance that the Porsche/VW/Audi group would purchase a Formula One team, with the specific intention of moving Audi's motorsport operations upmarket from sportscars to F1 - where it could take on its natural market competitors Mercedes and BMW in a straight fight, while leaving the former category open for a Porsche return to endurance racing. Toro Rosso would have been absolutely the perfect vehicle for such aspirations, but apparently a price of 500 million euro merely to reach a state of competitiveness before hitting the grid put the P-VAG board right off the concept, so, despite Red Bull Racing and Toro Rosso carrying VW branding on their motorhomes through using VAG products as team transport and having tie-ups in DTM, Toro Rosso will need to look further afield for a saviour. The pending ban on customer cars has now hit three teams: first Prodrive, then Super Aguri and now Scuderia Toro Rosso. While the former seem lost to the sport for ever - despite David Richards' assertions that the company could resurrect its F1 dream at some stage in the future - Aguri and Toro Rosso face difficult futures, particularly in view of KERS and own-chassis regulations. But, while Super Aguri have probably been salvaged, facilitated by the fact that their Leafield premises are capable of producing F1 cars - having in the recent past manufactured a whole series of Arrows designs, and more recently IRL kit for Menard - the sport must now concentrate on saving yet another independent team.